The month of November is a time to celebrate the rich and diverse cultures, traditions, and histories and to acknowledge the important contributions of our First Peoples. In the U.S. there are 567 Federally recognized tribal nations and Alaskan Native villages. 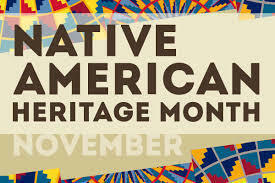 Heritage Month is also an opportune time to educate the general public about tribal nations, and to raise a general awareness about the unique place many of us now call home. The City of Marysville and the Marysville School District is fortunate to be a neighbor to a Sovereign Nation. The Tulalip Tribes give back and support the Marysville and Tulalip community in so many ways and we thank them for their generous contributions to improve the lives of children and adults through supporting education, protecting the environment, addressing homelessness, the opioid epidemic, and meeting many more human service needs in our community and beyond. In honor of Native American Heritage Month, and the elders, leaders, and families who make up The Tulalip Tribes, you are encouraged to learn more about the rich history and culture that is The Tulalip Tribes by accessing the websites at https://www.tulaliptribes-nsn.gov/Home/WhoWeAre.aspx , the Since Time Immemorial Curriculum at http://www.indian-ed.org/ and be sure to visit The Hibulb Cultural Center. In Lushootseed, the Native language of the Coastal Salish people, we say ʔut̕igʷicid čəɬ. “We thank you”.